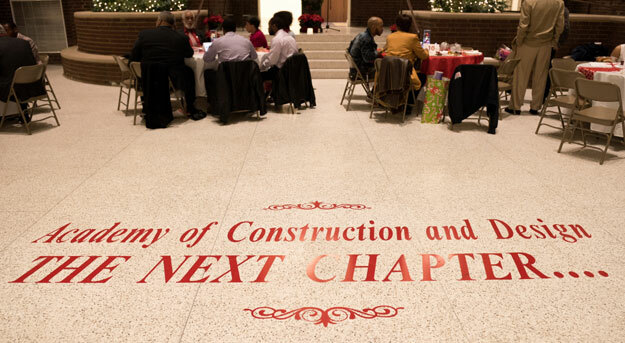 The words are sprawled across the entryway of the Francis L. Cardozo Education Campus west atrium, welcoming past and present students of the Academy of Construction and Design (ACAD). In vibrant red letters are these words: “The Next Chapter.” It’s a welcome befitting these young men and women, all connected by the Academy that launched in September 2005. Because We're Happy! Alumni reunite to celebrate 10 years of the Academy of Construction and Design at the redesigned Cardozo Education Campus. “We are here to pay tribute to the Academy of Construction and Design’s greatest accomplishment – you, the students who graduated or will graduate from the Academy at Cardozo,” said Carol Randolph, chief operations officer for the D.C. Students Construction Trades Foundation and co-founder of the Academy of Construction and Design, at a celebration nearly 10 years in the making. 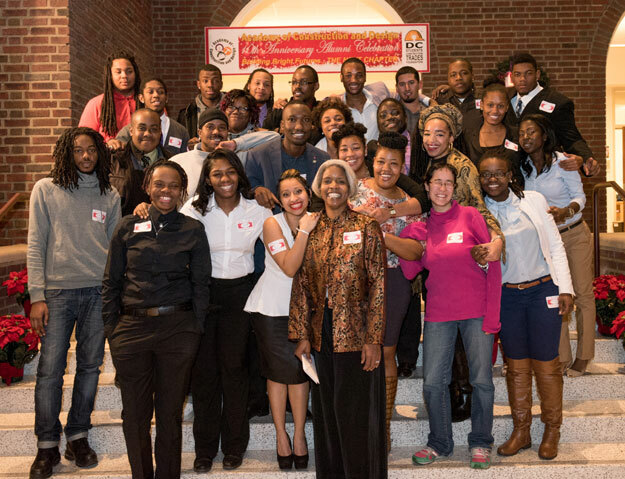 On Dec. 19, ACAD and the D.C. Students Construction Trades Foundation hosted the “10th Anniversary Alumni Celebration: The Next Chapter” to honor Academy alumni and the future Class of 2015. ACAD celebrated its accomplishments ahead of its official anniversary in the fall, when the program is expected to move from Cardozo. The program’s new home will be announced later this year. The Academy is designed to give students greater career opportunities by introducing them to skilled trades like carpentry and electrical while still in high school. The program has graduated more than 100 students since starting at Cardozo Senior High School, which has since been renamed and renovated, with the help of ACAD students. While the next chapter is unknown for some, those who have graduated from the Academy are already writing their own stories. Ingrid Lopez, Class of 2011, doled out hugs and shared smiles with former classmates – part of her “ACAD family.” Wearing a blouse, skirt and stilettos in lieu of her usual Metropolitan Police Department cadet uniform, Lopez praised the Academy for having touched “countless lives” over the years. ‘The Next Chapter’ Unfolds The entryway of the Francis L. Cardozo Education Campus west atrium, decorated in honor of Academy alumni and the future Class of 2015. “We celebrate that we beat the odds,” Lopez told the crowd, which included Miller & Long Chairman John McMahon and former principal of Cardozo, Reginald C. Ballard Jr.
It’s been a long journey for the Academy, born from the dedication of a group of business, community, school and faith-based leaders to return vocational and technical education to District of Columbia schools. Modeled after the Thomas Edison School of Technology in Montgomery County, Maryland, the JOBS Coalition as early as 2003 toured the school with then-principal Ballard. The program is built on the foundation of hands-on learning for its students. Academy alum Ivan Ango is one of those faces. He is currently studying integrated science and technology at James Madison University in Virginia. “Academy staff and partners sowed the seeds and we’ve grown and flourished. We are successful by anyone’s standard," he said. 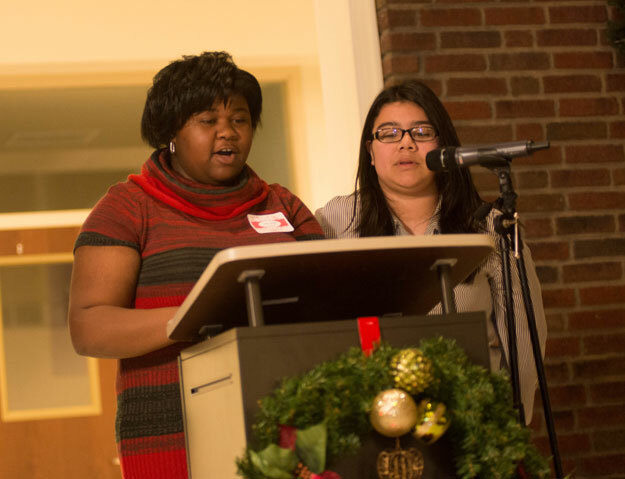 Keepin' It Class-y Class of 2015 students Taylor Herndon (left) and Angely Garay join forces in giving thanks to supporters of the career and technical education program. Over the years, ACAD students have worked with Habitat for Humanity of Washington, D.C. to build homes for needy families in Northeast, constructed the city’s first student-built house in the Brightwood community of the District, and are currently building a 180-square-foot “tiny house” to be unveiled in June. They are paying it forward by helping others, as believers in the Academy have helped them.